Additional option available! 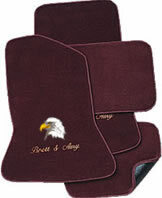 In addition to the plush material style, these floor mats are now also available in thick Berber carpet material. NOTE: Floor mats customized with monograms or logos are non-returnable. All sales are final on personalized (monogrammed or logoed) items. Add an extra touch of elegance and personalization with beautiful monogramming. This is not a cheap monogram that doesn't last. Your custom floor mat is carefully monogrammed using state of the art computerized equipment in a complimentary color to your floor mat assuring lasting quality and beauty. You can give your vehicle that unique look by boasting your favorite sport, military, animal or other logo on your floor mats. Beautifully embroidered in full color using state of the art computerized equipment for quality.